Product prices and availability are accurate as of 2019-04-04 13:17:06 EDT and are subject to change. Any price and availability information displayed on http://www.amazon.com/ at the time of purchase will apply to the purchase of this product. Please check the ISBN that your instructor provided. If the ISBN-13 does not match this product (9781305641587) or its Printed Access Card equivalent (9781305641594) this may not be the correct product. In some cases, you may also require a course code from your instructor. 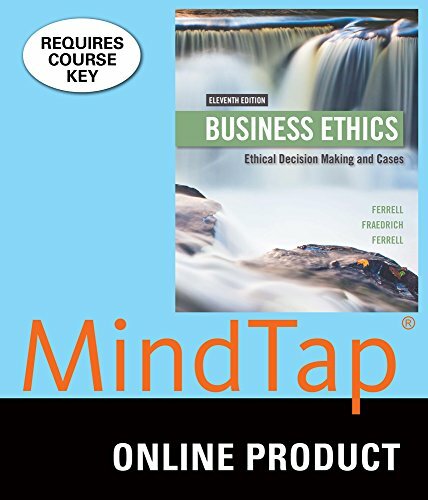 As a student using MindTap Management for Ferrell/Fraedrich/Ferrell's Business Ethics: Ethical Decision Making & Cases, 11th Edition, you have the tools you need to better manage your limited time, with the ability to complete assignments whenever and wherever you are ready to learn. Course material that is specially customized for you by your instructor in a proven, easy-to-use interface, keeps you engaged and active in the course. MindTap helps you achieve better grades today by cultivating a true understanding of course concepts, and with a mobile app to keep you on track. With a wide array of course specific tools and apps – from note taking to flashcards – you can feel confident that MindTap is a worthwhile and valuable investment in your education. Updated cases from authors and author-created assessment materials. Streamlined narrative content. Updated statistics, figures, and industry trends used as examples to enhance the narrative content. You will stay engaged with real world assignments such as the New Belgium Brewing case, and motivated by information that shows where you stand at all times--both individually and compared to the highest performers in class. MindTap eliminates the guesswork, focusing on what's most important to your instructor with a learning path designed specifically by your instructor and for your Marketing Strategy course. Master the most important information with built-in study tools such as the Business Ethics Simulation that help students stay organized and use their time efficiently.